Annie sang in the choir of St Paul’s Presbyterian Church where Ian attended Sunday school and he later joined the Young People’s Club, developing social and public-speaking skills. He studied advertising and accountancy by correspondence, finding the former more to his liking. Although ‘not the footballing type’, he played tennis as a young man and helped form the Mackay Lawn Tennis Association. By the late 1920s, Ian Wood, fortified by a strong bond with his mother, had developed into a businessman and public figure. On 9 April 1927, as secretary of the Mackay Ratepayers’ Association, he was elected an alderman on the Mackay City Council. Three years later, on 17 April 1930, he became Mayor of Mackay, having bowed to pressure from his mother, as well as from the editor of the Daily Mercury, to contest the position. Conscious of the dignity of the office and his own pursuit of fortune, he promptly announced his unavailability for ‘the opening of any tin-pot show’ and that the mayoralty would not be permitted to impinge on his business operations. Following an electoral change that widened the vote from ratepayers only to unlimited adult franchise, he narrowly lost his campaign for re-election in 1933 in a bitter contest with a Labor opponent. In Wood’s own estimate, the greatest achievements of his first incursion into local politics were realised, despite Labor Party opposition. These included the inauguration of the Mackay town plan, the first municipal town plan in Australia, and the construction of the Mackay Airport, which Wood, as mayor, opened in 1931. Political opposition descended into pettiness when the Labor aldermen on the council destroyed his vision of avenues of flowering tropical plants for Mackay by pulling out the newly planted specimens after they regained power. He did not re-enter local politics until 1939, when he again became an alderman, and then served as mayor from 1943 to 1952. Wood saw no conflict between his political and business aspirations. In partnership with George Wood (no relation), he subdivided and sold land and, indulging his love of books and reading, especially biography and travel, bought a combined newsagency and bookshop. After George’s retirement, Ian became its sole proprietor. In 1930 he formed Mackay Tours with several other Mackay businessmen. As chairman, he pioneered tours and cruises, as well as a resort development on Lindeman Island, the first tourist island in the Whitsundays. Mackay Tours undertook a national campaign to advertise the scenic appeal of Mackay and its surroundings, attracting the attention of documentary filmmaker, Cinesound Review Company. Recognising its tourism potential, Wood battled to save a pristine rainforest area, west of Mackay, from clearing for dairy farming. His efforts led to the gazettal of the Eungella National Park in 1941. His newsagency and bookshop took bookings for Mackay Tours and for the first airline, New England Airways, to fly into Mackay. As his travel business grew, he sold his newsagency and bookshop and founded the Ian Wood Travel Service, a business he operated for the rest of his life. From an early age, Wood was attracted to the conservative side of politics. He absorbed from his mother the belief that the interests of the poor, people like themselves, were best served by non-Labor governments. Conservative policies, he believed, were more business oriented, offering better prospects for investment and employment. Attracted by its regional presence, Wood joined the Country Party, the predominant conservative party in the Mackay area. He became president of the North Queensland Country Party and vice-president of the Queensland body. He was endorsed by the Northern Country Party and the Country National Organisation to contest the state seat of Mackay in a by-election in March 1943, following the resignation of Labor Premier William Forgan Smith. In his campaign, Wood referred to his public service, the fact that he had been mayor for three years and alderman for seven, his record as a local businessman and ‘booster’ for Mackay, and the need for greater development of infrastructure and industries, especially agriculture and tourism. Although unsuccessful, he polled strongly, significantly reducing Labor’s majority, the Daily Mercury speculating that had the voting system not been changed from preferential to first past the post, he probably would have won on preferences. Wood’s strong performance in the city of Mackay in the 1943 by-election encouraged him, two months later, to seek another term as mayor. He was successful and would dominate local politics for the remainder of the decade. He led progressive, popular administrations, as his sweeping re-election victory in May 1949 showed, when he ran as part of the ‘Citizens’ team, which he described as ‘not political’. He justly claimed this as a vindication of his council’s record on such matters as town planning, city beautification, tourism promotion and even the provision of cottage accommodation for aged and invalid pensioners. It was a performance that attracted statewide attention, and he served as president of the Queensland Local Authorities’ Association, the first North Queenslander to attain the position, and from 1951 joined the Australian Council of Local Government Associations as Queensland representative. He served on the Mackay Harbour Board from 1930 to 1933 and 1946 to 1951, and was president of the Mackay Chamber of Commerce from 1941 to 1952. Ian Wood was elected to the Senate at the December 1949 election and sworn in on 22 February 1950. After his return as mayor earlier in 1949, the Liberal Party had approached him with an offer of Senate nomination. Having previously resigned from the Country Party over dissatisfaction with its internal processes, he joined the Liberal Party and reluctantly agreed to stand. His reluctance was based on his dislike of Canberra’s winters and the financial costs of neglecting his business interests in Mackay. What swayed his decision was the Labor Government’s intention, announced in 1947, to nationalise the banking system. Any prospect of ‘socialising the country, or the Government controlling everything’ appalled Wood and, accepting the potential personal sacrifice, he was placed number two on the ticket and billed as an ‘honest sincere man of action’ who goes ‘looking for trouble’. Liberal Party organisation was rudimentary in 1949 Mackay. At a street corner meeting Liberal leader Robert Menzies opened the campaign mounted on the back of a lorry. Wood mobilised young people to mail out leaflets. Employees of private banks were also willing workers for the anti-nationalisation cause. Following a Liberal Party itinerary, he toured North Queensland, campaigning in many centres, including Townsville. He attributed his victory to the ‘main issue of socialisation’ and federal government neglect of North Queensland. Other priorities included local government and the development of North Queensland. After the poll was declared, he announced his determination to continue as mayor and live in Mackay ‘among his own people’. Portentously, he warned he was not entering the Senate to be a ‘rubber stamp’ for the Government. Wood earned a reputation as the ‘rebel Senator’. Indeed, independence was one of the hallmarks of his twenty-eight and a half years in the Senate. It manifested itself in his propensity to cross the floor and vote against his own party and government. The most notable example was the controversial Sales Tax (Exemptions and Classifications) Bill (No. 2) of 1960, which proposed increasing the rate of sales tax on cars by one-third in an effort to combat inflation and protect foreign reserves. The Government argued that the national economy was overheated but Wood deemed this a Sydney–Melbourne perspective, pointing to high unemployment in Mackay and other Queensland provincial cities and the depressive effects of a Canberra-induced slump in retail car sales. Brushing off hostile interjections from his Liberal colleagues, he described his dilemma: if he voted for the measure it would appear he had succumbed to pressure, if he voted against the bill it would be said he was trying to wreck his own government. He promised that he would consider the interests of Australia, and particularly Queensland, before casting his vote according to his conscience. Despite a last-minute plea from Prime Minister Menzies, Wood and the Tasmanian Liberal, Reg Wright, voted with the Opposition on 5 December 1960. Their defiance was watched, ominously, from the gallery by Menzies and the Minister for Trade, John McEwen. With twenty-nine votes for and against, the motion for the second reading was defeated. However, a decision by Senator Wright to abstain from further voting allowed the recommittal of the bill two days later, when it passed twenty-nine votes to twenty-seven, with Wood alone crossing the floor. His rebellion earned him a ‘snubbing’ from some colleagues and ‘booing’ in the party room. Government efforts to find ‘some muck’ on Wood came to nothing, particularly after it emerged he was the only parliamentarian not to own a car. The public response, especially in Queensland, was enthusiastically supportive. Intimations of disciplinary proceedings faded as over 3000 letters and lavish media attention indicated that public opinion was on Wood’s side. Four months later, the Government had revoked its car sales tax increase, Wood later recalling his successful opposition as his ‘favorite political memory’. The issue, however, had wider ramifications for Australian political history, contributing to the Government’s near defeat in the 1961 election. The 1960 Sales Tax Bill was the best known, but not the only, occasion on which Wood crossed the floor. Other unpopular measures on which he voted with the Opposition included airport levies, the abolition of funeral expenses for pensioners, and an inadequate government explanation of the use of VIP aircraft by ministers. When the Whitlam Government successfully moved in 1974 for reduced tax deductions for education expenses, Wood, alone in the Liberal–Country Party Opposition, disagreed, asking that his protest be recorded. As a ‘keen anti-smoking … and anti-liquor person’, he supported Labor’s unsuccessful amendment to make radio and television tobacco advertisements carry health warnings. Wood’s floor crossings after 1960 did not generate the same publicity or animosity from colleagues as his stand on car sales tax. Yet his contempt for party solidarity and close ear to his North Queensland constituents could still raise the ire of fellow Liberals. 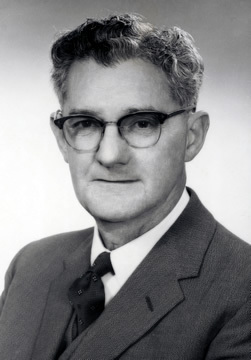 In 1966 Labor garnered his vote for an amendment to the Beef Roads Act by proposing the funding of a road from Mackay to its hinterland pastoral centre of Nebo. As a ‘reprisal’, government senators voted against him in an unprecedented party ballot for the post of Acting Chairman of Committees. An unrepentant Wood declared: ‘I am a Senator for Queensland … Elected representatives go to Canberra as legislators, not as rabbits’. A similarly robust independence marked his service in the mid-1950s on the Senate Select Committee on the Development of Canberra. Wood filed a dissenting report, believing that too many core functions were being isolated in an extravagant and ‘un-Australian’ national capital. He opposed the select committee’s recommendations relating to the creation of a separate ministerial portfolio for the ACT, including the establishment of a single authority for the development of Canberra (later realised as the National Capital Development Commission), as well as the creation of an ACT Legislative Council. He called for the Griffin Plan and the Canberra town plan to be redesigned. Wood first crossed the floor in 1952 and went on to do so on 130 occasions. One of his most important votes was the one that established the Senate legislative and general purpose standing committees on 11 June 1970. Proposed by the Leader of the Opposition in the Senate, Lionel Murphy, the motion was passed by twenty-seven votes to twenty-six, and would have been negatived without Wood’s vote, as the only Government member to cross the floor. Wood did not vote on the motion by Liberal senator Ken Anderson for the establishment of estimates committees, and voted against an amendment by Gair, for the Democratic Labor Party (DLP), which advocated delaying the establishment of the standing committees, thus tying the vote and defeating the motion. On 19 June, he voted in favour of a Labor motion relating to the membership of standing committees and against a DLP amendment. Both votes were tied and both were negatived. Wood did not attend the Senate sitting on 19 August that finalised the mechanics of the committee system, reverting to the more gradual introduction earlier proposed by Gair. Underpinning Wood’s defiance of party discipline in the Senate were the high values he placed on democracy and the constitutional functions of the upper house. For Australia to be a true democracy, he argued, a parliamentarian must be able ‘to express himself clearly, according to his conscience … in the best interests of this country’. In his oral history interview, he vigorously defended malapportionment of the vote, in order to give a greater vote to rural industries. Regardless of party politics, the Senate, he said, existed to protect the states and operate as a house of review. The review function empowered it to alter, and even negate, government legislation. Given that Wood acted out his beliefs on the roles of the parliamentarian and the Senate, it is unsurprising that he neither attained ministerial rank nor counted many fellow senators as close friends, nor did he seem to care very much. Instead, he found his confidants and advisers among parliamentary officers, especially those attached to the Senate. From this network, he doubtlessly derived ammunition for the successful campaigns he waged against a series of referendums in the 1960s and 1970s, which he believed would weaken the power and status of the Senate. These included efforts, supported by all major political parties, to break the constitutional ‘nexus’ between numbers in the House of Representatives and Senate, so that membership of the former could be increased without a proportionate addition to numbers in the latter. Similarly damaging to the Senate’s influence were proposals for its elections to be held whenever the lower house was dissolved. In speaking against his own government’s Constitution Alteration (Parliament) Bill in 1965, Wood maintained that breaking the nexus would lead eventually to an ‘inordinately large and expensive’ House of Representatives and ‘practically to the abolition of the Senate’, anathema to one who held that the Senate’s constitutional role was non-negotiable. Moreover, it was an issue on which he would never permit himself to vote as a ‘party hack’. When Prime Minister Malcolm Fraser urged support for a 1977 referendum to ensure Senate elections whenever the House was dissolved, Wood vehemently denounced him for inconsistency, since Fraser had opposed a similar move initiated by Labor in 1975. Wood’s hostile attitude to Fraser was typical of his lack of deference towards Liberal leaders. He even scolded Menzies for his Government’s ‘long list of attempts at erosion of the powers of Parliament’. Despite supporting John Gorton for the leadership in 1968, Wood subsequently turned against him because of his ‘unfortunate’ personal behaviour, especially after the Liberal Party’s poor performance in the November 1970 half-Senate election. In a party meeting in February 1971, Wood moved that the leadership be declared vacant. The motion lapsed for want of a seconder, leaving him disgusted with the embarrassing silence of his colleagues, many of whom had been vocal in the corridors, urging him to move just such a motion. Wood’s assessment of his fellow Liberals was scathing. He was sickened by their ‘pandering’ to the prime minister of the day as they sought portfolios, and much preferred an elected ministry. Senators, he felt, should not be ministers, because they required a degree of independence from government in order to scrutinise legislation. One of Wood’s most trusted advisers was the Clerk of the Senate, J. R. Odgers, whose book on Senate practice Wood regarded as ‘a Bible’. The association between the two was potently illustrated in the ‘Gair affair’. This arose in March 1974 when Prime Minister Whitlam, attempting to create an additional Senate vacancy to enhance Labor’s prospects in a scheduled mid-year half-Senate election, offered DLP Senator Gair the ambassadorship to Ireland. Gair accepted but did not immediately resign from the Senate. After obtaining advice from Odgers, Wood contacted Queensland Premier Joh Bjelke-Petersen and advised him to stymie the manoeuvre by issuing the election writs for the normal five Senate vacancies before Gair’s resignation. The Queensland Government could then fill the seat as a casual vacancy. Wood, a teetotaller, arranged for a more gregarious colleague, Senator Ron Maunsell, to detain Gair over beer and prawns, while Bjelke-Petersen organised the writs in Brisbane. The strategy worked. Whitlam was humiliated, deprived of the extra Senate vacancy in Queensland and saddled with an unpopular appointment in Dublin. Wood’s greatest contribution to the Senate and Australian democracy was in his chairmanship of the Senate Regulations and Ordinances Committee. He was on the committee for over twenty-eight years and served as its chairman for nearly twenty-two, stepping down during the Whitlam interregnum. He made the committee the custodian of ‘the rights of the Parliament and of parliamentarians’ and was fearless, independent and scrupulous in his scrutiny of subordinate legislation. If necessary, he crossed the floor to ensure that committee recommendations were implemented. Senatorial colleagues from all sides of politics acknowledged his formidable performance as chairman, and many continued to do so long after he had gone. Particularly noteworthy was his insistence that delegated legislation did not breach individual rights, and that ministers and their bureaucrats did not usurp the prerogatives of Parliament. Wood elevated the status and authority of the Senate Regulations and Ordinances Committee to the extent that its recommendations, even for disallowance of a regulation, almost always commanded Senate acquiescence. In the 1970s most notices for disallowance were withdrawn, usually because the minister was alerted and changes made to the relevant legislation. The committee’s work raised the prestige of Parliament and attracted international attention while the committee itself became a model throughout the Westminster world. Wood only spoke in the Senate when he felt he had something worthwhile to say. He prided himself on not using notes and always spoke ‘shortly, clearly and to the point’. Despite concurrent careers in local politics and business, he found his workload undemanding. He reluctantly engaged a research officer but never used her services. He spoke mostly on subjects about which he had personal experience and strong pro-business views: northern development, tourism, the sugar industry, civil aviation and industrial relations. On tourism he was far-sighted, urging the Government to recognise its potential as a national industry and fund its promotion accordingly. He even contemplated government construction of hotels in emerging tourist destinations in northern Australia. In the 1950s, he was critical of industrial unrest on the waterfront, diagnosing the ‘root trouble’ as ‘communism in the Waterside Workers Federation’. In February 1956 he made a speech in the Senate about corruption in the granting and extension of pastoral leases in Queensland, forcing then Premier Gair to establish a Royal Commission. Conscious of his single-parent upbringing, he urged more generous treatment of widows with children. Ian Wood’s anti-communism in the 1950s sharpened partisan bitterness in Mackay local politics and he was defeated by a Labor rival in the 1952 mayoral contest. However, he regained an aldermanic position between 1955 and 1958 and was re-elected to serve his last term as mayor from 1967 to 1970, serving again as an alderman from 1970 until 1973. By this time, Cold War feuding between Labor and its conservative rivals had diminished in intensity and Wood’s 1967 Progressive Team included two local Labor identities as aldermanic candidates. As Wood enjoyed a renewed, and less partisan, mandate in Mackay after the mid-1960s, he also became increasingly disenchanted with the political and social movements that were changing Australia in fundamental ways. A member of the Commonwealth Immigration Advisory Council from 1951 to 1962, he was uncomfortable with multiculturalism and the increasing proportion of non-European immigrants, while the drive to end discrimination on the basis of gender gave Wood the ‘willy-wobblies’. He dismissed the new Aboriginal leadership that emerged in the 1970s, describing his Liberal colleague, Neville Bonner, as ‘only half-Aboriginal’. Having lost his number one position on the Liberal ticket, Wood succumbed to party pressure and retired from the Senate in June 1978. His ranking had dropped to fifth place and, according to the Courier-Mail, the Liberal Party had told him that he was too old and would not be re-endorsed. He hosted a farewell party in Mackay attended by Bjelke-Petersen and Murphy, now a Justice of the High Court, who shared his passionate belief in the value and integrity of the Senate. He spent his remaining years in Mackay, an ‘ascetic-looking old gentleman in braces and a suit’, riding his bicycle, working in his travel agency and attending Liberal Party branch meetings. He took a quiet pride in the wealth he had accumulated from business operations and some canny investments, particularly during the mineral boom. He revelled in devising legacies for the city of Mackay, its charities and institutions. He donated a large parcel of land in North Mackay to the city council to be developed into Annie Wood Park, as a memorial to his mother. His sister, a talented pianist, who died in 1984, was commemorated with a gift of $80 000 enabling the construction of the Whitsunday Anglican School’s Pansy Wood Music Centre. Local charities were listed as beneficiaries under his will. Ian Wood died in Mackay on 7 January 1992. He was buried at the Mount Bassett Cemetery, next to his mother and sister, after a service at St Paul’s Uniting Church. Posthumously, he was appointed a Member of the Order of Australia for service to Queensland. In Wood’s own appraisal, his most creative work was done as alderman and Mayor of Mackay in the fields of town planning, city beautification and tourism development. The establishment of the Eungella National Park provided him with the most personal satisfaction. He was rightly proud of his chairmanship of the Senate Regulations and Ordinances Committee. In this role, he demonstrated that a backbench position was no barrier to elevating the public perception of the upper house, and, perhaps more importantly, the Senate’s sense of its own mission. In bringing about such a change, he had withstood considerable pressures. Senator Withers found the right words when he said Wood ‘had the courage to face his colleagues in government, to disagree with them and to come into … [the Senate] and vote according to his conscience. No higher tribute could be paid to any senator’. Ian Alexander Christie Wood, Transcript of oral history interview with Ron Hurst, 1984, POHP, TRC 4900/84, NLA, pp. 1:2–5, 1:8, 1:14–16, 1:18; Daily Mercury (Mackay), 9 Jan. 1992, p. 8. Wood, Transcript, pp. 1:10, 1:17–18, 2:1–2, 2:6, 2:8–11; Mackay Daily Mercury, 7 Apr. 1927, p. 11, 11 Apr. 1927, p. 7, 18 Apr. 1930, p. 5, 8 May 1933, p. 8, 9 May 1933, p. 6; ‘History of Town Planning in Mackay’, SIW/MACKAY/TOWN PLAN/11, ‘Ian Wood’s Service to Mackay and Australia’, SIW/PERSONAL/2, Ian Wood Papers, James Cook University Library Archives; Mackay Airport, 1931–1991, Souvenir, Mackay Printing and Publishing Co., Mackay, Qld, 1991, pp. 21, 30; K. H. Kennedy, Mackay Revisited, Mackay City Council, Mackay, Qld, 2002, pp. 278–80. Daily Mercury (Mackay), 9 Jan. 1992, p. 8; Wood, Transcript, pp. 2:8, 2:13, 2:18–19; Daily Mercury (Mackay), 30 Oct. 1987 (supp. ), p. 12; John Kerr, Pioneer Pageant: A History of the Pioneer Shire, Pioneer Shire Council, Mackay, Qld, 1980, pp. 223–4; Todd Barr, No Swank Here? : The Development of the Whitsundays as a Tourist Destination to the Early 1970s, Studies in North Queensland History no.15, Department of History and Politics in conjunction with the Department of Tourism, James Cook University of North Queensland, Townsville, Qld, 1990, pp. 9–10; Mackay Daily Mercury, 11 May 1933, p. 8; Courier-Mail (Brisb. ), 5 Mar. 1987, p. 8; Queensland Government Gazette, 25 Jan. 1941, pp. 173–4. Wood, Transcript, pp. 1:6, 10:3; Mackay Daily Mercury, 6 Mar. 1943, p. 2, 22 Mar. 1943, p. 1. Daily Mercury (Mackay), 3 May 1943, p. 3, 30 May 1949, p. 2, 12 May 1949, p. 2, 26 Apr. 1949, p. 2; A. S. Cowley, ‘The Local Government Story’, Local Government, June 1952, p. 5; H. A. Moore, The Mackay Harbour Story, Mackay Harbour Board, Mackay, Qld, 1978, p. 74; Mackay Chamber of Commerce, Annual reports, 1942, 1952. Wood, Transcript, pp. 2:18, 3:3, 9:17, 9:19, 10:3, 10:5; Courier-Mail (Brisb. ), 1 Dec. 1949, p. 4; Daily Mercury (Mackay), 15 Dec. 1949, p. 2. CPD, 5 Dec. 1960, pp. 2032–40, 2043–44; Telegraph (Brisb. ), 5 Dec. 1960, p. 5; Courier-Mail (Brisb. ), 8 Dec. 1960, p. 1; CPD, 7 Dec. 1960, p. 2154; Courier-Mail (Brisb. ), 9 Dec. 1960, p. 16; Wood, Transcript, pp. 5:1–5, 5:13; Telegraph (Brisb. ), 10 Dec. 1960, p. 5; CPD, 11 Apr. 1961, p. 412; Courier-Mail (Brisb. ), 5 Mar. 1987, p. 8. CPD, 28 Nov. 1968, pp. 2513–17, 2529, 27 Apr. 1976, pp. 1280–1, 1286–7, 5 Oct. 1967, p. 1266, 5 Dec. 1974, pp. 3215–17; Wood, Transcript, pp. 6:14, 7:14; CPD, 1 June 1972, pp. 2435–7, 2440, 1 Sept. 1966, p. 290; Courier-Mail (Brisb. ), 17 Sept. 1966, p. 16; CPP, S2/1955; Deirdre McKeown, Rob Lundie and Greg Baker, ‘Crossing the Floor in the Federal Parliament 1950–August 2004’, Research Note, CPL, no. 11, 2005–6; CPD, 11 June 1970, pp. 2342–67. CPD, 11 May 1971, p. 1702; Wood, Transcript, pp. 3:6, 3:15–16, 10:10; CPD, 12 Aug. 1954, pp. 201–2, 11 June 1970, p. 2362; Age (Melb. ), 3 Dec. 1965 p. 3; AFR (Syd. ), 18 Feb. 1977, p. 4; CPD, 2 Dec. 1965, pp. 2002–3; Courier-Mail (Brisb. ), 18 May 1977, p. 13. CPD, 10 Dec. 1965, p. 2282; Wood, Transcript, pp. 6:10–11, 6:18–20, 7:7, 11:15; Ian Hancock, John Gorton: He Did It His Way, Hodder, Sydney, 2002, p. 308. Wood, Transcript, pp. 7:21–4; CPD, 25 Feb. 1992 (R), p. 10. CPD, 27 Mar. 1973, pp. 571–7, 4 Oct. 1960, p. 839, 25 Feb. 1992, pp. 30, 33, 28 Oct. 1965, p. 1304; Daily Mercury (Mackay), 29 May 1978, p. 3. Wood, Transcript, pp. 2:2, 3:8, 11:16–17; Daily Mercury (Mackay), 29 May 1978, p. 3; CPD, 26 Feb. 1964, pp. 51–6, 20 Oct. 1959, pp. 1058–62, 23 Oct. 1957, pp. 740–2, 6 Nov. 1952, pp. 4214–15, 1 June 1977, pp.1797–9, 8 Oct. 1952, p. 2630, 15 Sept. 1955, p. 151, 11 Nov. 1954, p. 1384, 16 Feb. 1956, pp. 41–7; Denis Murphy, Roger Joyce and Margaret Cribb (eds), The Premiers of Queensland, UQP, St Lucia, Qld, 1990, p. 464; CPD, 16 Nov. 1950, p. 2531. Kennedy, Mackay Revisited, p. 279; Daily Mercury (Mackay), 22 Apr. 1958, pp. 1–2, 4 Apr. 1967, p. 2, 19 Apr. 1967, p. 5; Herald (Melb. ), 6 May 1967, p. 9; Australian (Syd. ), 30 Nov. 1972, p. 10; Wood, Transcript, pp. 6:15–16, 7:10, 7:12, 8:2, 8:8–9. Courier-Mail (Brisb. ), 22 Nov. 1975, p. 3; Wood, Transcript, pp. 10:15, 11:25; 12:1, 12:3; Courier-Mail (Brisb. ), 18 Feb. 1977, p. 5; Telegraph (Brisb. ), 2 June 1978, p. 2; Courier-Mail (Brisb. ), 5 Mar. 1987, p. 8; Daily Mercury (Mackay), 9 Jan. 1992, pp. 8, 21; Alan Reid, The Gorton Experiment, Shakespeare Head Press, Sydney, 1971, p. 409; Daily Mercury (Mackay), 15 May 1992, p. 1, 11 Jan. 1992, p. 5; Courier-Mail (Brisb. ), 25 Jan. 1992, p. 36; CPD, 27 Mar. 1973, p. 573. This biography was first published in The Biographical Dictionary of the Australian Senate, vol. 3, 1962-1983, University of New South Wales Press Ltd, Sydney, 2010, pp. 296-304.